Summary: Erickson Consulting Engineers, Inc. (ECE) performed the engineering and permitting for the Water Cay Resort Marina and Beach Development Project. This project includes three oceanfront T-head groins and a 240,000 cubic yard oceanfront beach restoration, a marina beach with associated coastal structures (three groins, a pier, and a bulkhead), bungalow beach fill and piers, canal to provide a tidal connection to mangroves, a boat access channel, a channel between the interior canal and marina access channel, and dune enhancements. Phase 1 of the project which includes the terminal oceanfront groin and a 60,000 cubic yard beach restoration was scheduled to be constructed first, with Phase 2 scheduled to follow within 1 – 2 years afterwards. Challenges: Phase 1 of the project is needed at this time to mitigate for the severe land losses from the 2008 Hurricanes (Hanna and Ike). The 175 ft terminal groin is to be constructed during Phase 1 to stop further loss of upland land areas and restore the beaches fronting a future hotel site that is affected by chronic erosion. 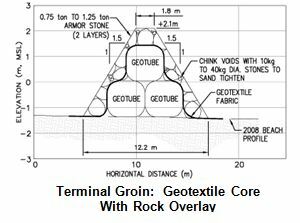 The groin is designed as a geotextile container core with a rock overlay. Schedule and Budget: The design/permitting project budget and schedule were maintained and the residents and community pleased with the outcome. The project is currently on-hold due to development legal issues.